4x Lamb Merguez to 0.5lb. This sausage is certainly one of the more exotic products we have. 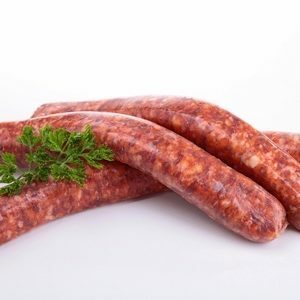 Despite not being very popular in Germany (since we have so many sausages already) this very spicy lamb sausage is very famous in France, Morocco and Portugal. However it is becoming more popular as the variety of flavors in the Merguez are just outstanding. There is an explosion of flavors when you eat it. Among other things it includes Harissa, Ras El Hanout and Cinnamon. It is very spicy so it makes sense to add something to take away some of that heat. Try putting it in a curry. Because the coconut milk will take away some of the heat while equally distributing the great flavors into the whole dish. Although for people that like spicy: Just have it with some couscous and enjoy the heat. We never use MSGs or mechanically separated meat in our products. Because we believe that in the right sourcing of meat. And we believe in using fresh ingredients. But most of all we believe that you don’t need additives to get a great flavor. Just the right ingredients, recipe and technique. 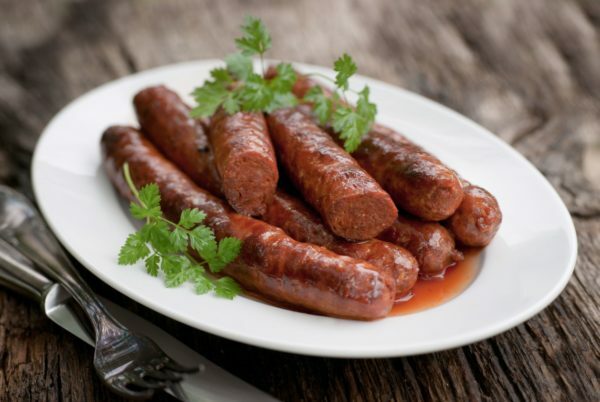 Make sure you try our sausages and judge yourself. Ingredients: Lamb, water, oil, salt, spices, fresh onion, fresh garlic. No Nitrates added. Minimally processed. Family run and operated business. Facility in California. Great sausages for BBQ and Snacks. Machines from Germany. 100% German Family. Traditional Recipes from Germany with a modern approach. Great for kids. Great for adults. Just perfect for everybody.